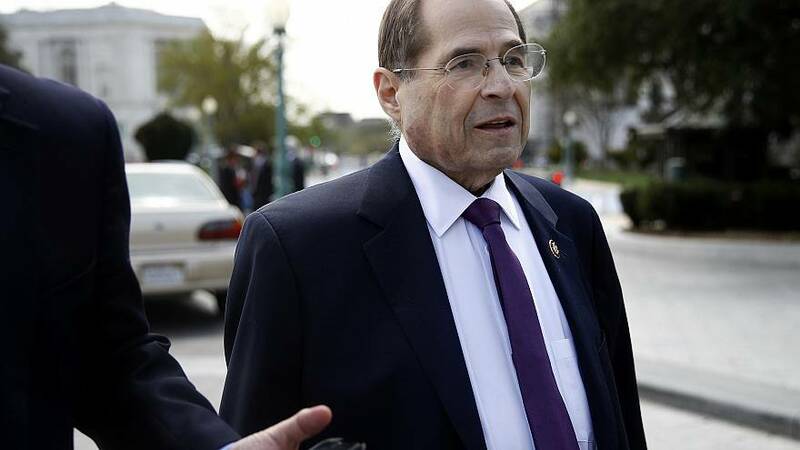 House Judiciary Chairman Jerrold Nadler, D-N.Y., said Sunday that special counsel Robert Mueller's report could contain "grounds for impeachment" of President Donald Trump or other actions and that "some" of the report would not leak publicly if provided without redactions to his committee. In an interview on CBS's "Face the Nation," Nadler said, "Congress has a right to the entire report, with no redactions whatsoever, so we can see what's there." Pointing to recent reporting by NBC News, Nadler said some members of Mueller's team "seem to be very unhappy" with Attorney General William Barr's summary of the report. The New York Times and The Washington Post first reported on the Mueller team's frustration with Barr's summary. Asked about what the report might contain, Nadler said, "There could be grounds for impeachment, there could be grounds for other actions, there could be things the American people ought to know." "You know, you can commit shameful acts, you can commit complete betrayals of the public interest without committing impeachable acts," Nadler said. "And if you did that, the public ought to know that too. And the standard here is not an impeachment. The standard is we have to protect the public from presidential misconduct." "The committee has a very good record of protecting information which it decides to protect," he added. Appearing on the same program, Trump's attorney Rudy Giuliani said he "would like" Nadler "to get all the information," even protected grand jury testimony. "Except for little quibbles, I'm not worried about the report at all," Giuliani said, adding, "There's no way those two good lawyers [Barr and Deputy Attorney General Rod Rosenstein] would have written that kind of letter if there was any issue." Last month, Barr released a four-page summary of Mueller's report, saying that the special counsel did not find evidence of a criminal conspiracy between the Trump campaign or its associates and the Russian government in its effort to influence the 2016 presidential election. Barr's summary also said Mueller could not come to a conclusion on whether Trump obstructed justice, and the attorney general determined that, based on the evidence, Trump did not do so. Prior to becoming attorney general, Barr authored a memo critical of Mueller's obstruction probe, a point that drew criticism from those skeptical of Barr's impartiality. Meanwhile, the Times, Post and NBC News reported that some members of Mueller's team have expressed frustration that Barr did not accurately portray the findings of the report. Members of the team believe the evidence that Trump sought to impede the investigation is stronger than Barr suggested, a U.S. official who has spoken with the members told NBC News. Justice Department officials said Barr had no choice but to render a judgment because of the rules governing the special counsel's probe. Nadler's panel on Wednesday voted to authorize a subpoena for the full, unredacted report. Barr has said he intends to provide the report to lawmakers this month with certain material removed. He said he needs more time to edit the report, which runs almost 400 pages, for sensitive and classified information. Trump tweeted Sunday about the string of stories about Mueller's team's frustrations over Barr's summary of the special counsel's report. "Looks like Bob Mueller's team of 13 Trump Haters & Angry Democrats are illegally leaking information to the press while the Fake News Media make up their own stories with or without sources — sources no longer matter to our corrupt & dishonest Mainstream Media, they are a Joke!" he wrote.